Are you guilty of making prayer too difficult? I know I do at times. Okay, most times. I was thinking the other day how I have been walking with you this entire year, discovering, exploring, and tasting prayer. Though the adventure has been rich and full, how am I going to remember to “do” all these prayers, these wonderful “techniques” and of course, do them correctly so I earn an A in the course? I know. I know. I know that isn’t what God wants. Me neither. 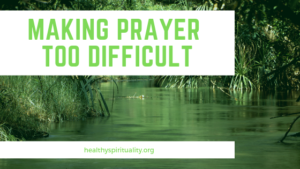 In September, a word to frame our traveling with prayer will be “difficult.” Today is reflecting on making prayer too difficult and next week will be when it is too difficult to pray. Earlier in the summer, I updated a free prayer resources called “The Prayer Tool Box. ” This pdf has lots of digital and analog ideas for spending your time with God. Click the button at the bottom of this post to get yours if you didn’t get one in June. K.I.S.S. – Keep It Simple, Sweetie! Sometimes the best kind of prayer is simply no words at all. Just gazing and being with God. Other times tears and sighs lead directly to God’s presence. Ann Lamott wrote a book about prayer and the title says it all: Help. Thanks. Wow. We don’t pray because we aren’t sure if we will do it right. Or will mess it up. Then what would God think about us? God doesn’t care about the how-to; God cares about you. Just talk with God. Keep prayer simple. Prayer floods my heart with music. Two weeks ago in church, my mind wandered. I just wasn’t present in my heart and mind. This is supposed to be worship. I “should” be focused on God. I finally gave up – wasn’t go to happen this morning. Just go through the motions and maybe next week will be better. We closed the service with this hymn – O Jesus, I have Promised. I wasn’t that familiar with this one but knew the tune. This hymn was written by John Bode for his children’s confirmation day. The words became my prayer and invitation into God’s presence, sort of my confirmation from God that he is present even when I am not. remain forever near me, my master and my friend. nor wander from the pathway if you will be my guide. Oh, let me feel you near me; the world is ever near. I see the sights that dazzle, the tempting sounds I hear. but Jesus, then draw nearer to shield my soul from sin. above the storms of passion, the murmurs of selfwill. now speak and make me listen, O Guardian of my soul. that where you are in glory your servant shall be too. Later that day I worshipped at home when I listened to the words of a contemporary song by Natalie Grant called “Enough.” Praying this song wasn’t difficult at all. When we can’t pray, others can through music. Just listen. Read the lyrics out loud instead of singing. Music opens the doors into God’s presence. Even when we make praying too difficult. How do you make prayer difficult? What have you learned to counter this?